The Association of Families and Friends of the Victims of Gdeïm Izik butchery sent a letter to the UN Secretary-General, Antonio Guterres, claiming the right to justice and demanding that the crimes committed against the eleven security enforcement agents do not go unpunished. 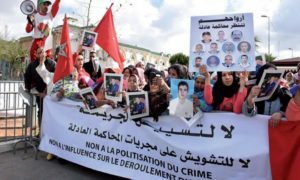 The eleven agents were savagely murdered by a pro-Polisario horde, while they intervened, in November 2010, to dismantle a camp set up in the locality of Gdim Izik near Laayoune. The agents were unarmed. The victims’ families are also considering dispatching a delegation to the UN SG to express their deep sorrow and their expectations that posthumous justice be rendered to the eleven agents who have been murdered and whose bodies have been mutilated. In its letter, the Association welcomed the decision of the Appeal Court to refer the case to a civil court in Salé, after an initial ruling by the Rabat military court. It also expressed the bereaved families’ amazement at the maneuvers of the defendants’ lawyers who attempt to hinder the association’s action, primarily its decision to file a civil suit in the case, reported the Moroccan portal le360.ma. For the Association, it is question of enforcing all the victims’ rights during the trial of the 23 defendants involved in the Gdeim Izik carnage. The trial will resume on May 8 before the Salé Court of Criminal Appeal. “Our approach is not meant to obtain material compensation, but to restore the truth and ensure conditions for a fair trial,” says the association, which deplores the fact that “the defendants and some of their lawyers try to politicize the trial”. The Association recalls in this vein that, during the trial, “the defendants refused to answer questions relating to their crimes, and instead gave answers unrelated to the charges against them, in a bid to be given political status”. The Association pointed out that “such a status has nothing to do with the case, as the defendants are not being prosecuted for their opinions or for their political positions, but, as stated in the indictment, for violence against our children that led to their premediated death and mutilation of their corpses”. According to the Association, the bereaved families claim their right, as indirect victims, to the truth and to guarantees that the perpetrators of the crime would not go unpunished.